When you buy a flat, maisonette or other leasehold property you are in essence buying the sole right to occupy that property for a specified period of time. After the expiry of this period the property will revert to the landlord, known as the freeholder. The document that governs the relationship between you and the freeholder is the lease. It is very important that you understand the requirements of the lease as well as making investigations into the company that manages the affairs of the freeholder. Early recognition of potential problems can avoid considerable headaches later on. It is obviously important to check the length of time left on the lease. If the remaining term falls below a certain threshold, as well as having a considerable impact on value, it can be difficult to secure a mortgage. However it is possible to extend your lease but there is an obvious additional cost associated with this. Before exchanging contracts it is very important that you or your solicitor has read and understood the lease. This will enable you to make an informed decision about the potential purchase. 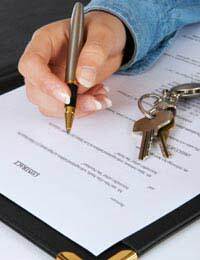 There are often charges and fees payable in connection with the lease such as a service charge, ground rent or a managing agent fee. Often the managing agent is not the same company or individual as the landlord. Ground rent may be described as a ‘peppercorn’ or a small amount of money, e.g. £10 per annum. It is vital that you take into account these fees before purchasing the property, and also to bear in mind that these fees can be subject to review and rate increases. If as the leaseholder you fail to pay these charges, the landlord can as a last resort repossess the property. On occasion, there are also other terms contained in the lease such as ‘no pets allowed’ or ‘no parking on the grass’. A standard lease will make you, the leaseholder, responsible for everything within the four walls of the property – including the floorboards, ceiling and plaster. However this does not usually include structural or external walls as the landlord is usually liable for the building’s repairs and maintenance. What is the cost of the service charge each year? When is the amount payable due for review? Do leaseholders pay money into a fund to help pay for repairs? For which parts of the building are all leaseholders responsible? What is included in the insurance policy for the building? The managing agents or freeholder should be able to provide the last three years of accounts. If these accounts are not forthcoming, or are defective, it may be a sign that the building is not well run. A tip is to spend some time looking at the ‘common parts’ of the building when you view the property. Delapidated or hastily completed repairs can be signs of trouble ahead. Make enquiries as to the residents committee and if possible speak to current or past residents to get an idea of the situation. It is not uncommon for residents committees to have major disputes with managing agents, although there are many managing agents that are highly proactive and efficient. This is a common problem in leashold arrangements and frequently flat owners feel they are overcharged for fees that do not seem to justify the work carried out and are therefore questionable. You have a few options; to firstly dispute the charges, appoint a new management company or yourself and the other leaseholders can take over the management with the Right To Manage (RTM), please see gov.uk link here. You may have to do a bit more research regarding your options, but, in the first instance, I hope this helps.